The Episcopal Church usually baptizes infants. 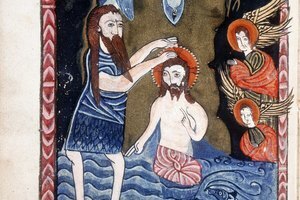 Baptism is the sacrament of becoming a Christian, which is practiced in many denominations, but slightly differently in each. Episcopalians generally baptize infants, but will also baptize adult converts under some circumstances. The baptism is usually performed as part of a Eucharistic service, as described in the Book of Common Prayer. Episcopalians will baptize infants, as well as adults or older children who were not previously baptized in any other Christian denomination. If no one knows whether a person has already been baptized, a ceremony called conditional baptism may be performed. Adults and older children seeking baptism must wish to follow Christian teachings and are usually required to take a class or go through counseling with a priest to make sure they understand the commitments involved. The baptism is usually performed during a Mass on a Sunday or other holiday, and is officiated by a priest or bishop. The candidates are presented by sponsors, who are Christians who wish to support the candidate spiritually. For a child these sponsors are called godparents. The candidates — or, for an infant, the sponsors — are asked questions regarding their commitment to Christian teachings. Then the candidates are baptized by the officiant, who pours a small amount of water over their heads. The Episcopal Church performs several other ceremonies related to baptism. The most common is confirmation. For individuals who were baptized as infants, confirmation as adolescents or adults requires them to take responsibility for their own baptismal vows, which were previously made in their name by their sponsors. Confirmation is performed by a bishop and also makes recipients full members of the Episcopal Church rather than just Christians. Candidates for confirmation also usually undergo a period of instruction prior to the ceremony. 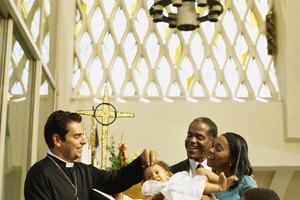 While most Episcopalians just go through baptism and sometimes confirmation, there are several variations for special circumstances. For example, Episcopal Church policy is that any baptized Christian may perform a simple emergency baptism in life-threatening situations. Also, Christians who have been both baptized and confirmed in another tradition may be received into the Episcopal Church by a bishop, and Episcopalians who would like to reaffirm their baptismal vows with a bishop for any reason may do so. Is the Presbyterian Baptism Trinitarian? Gee, Laura. "The Episcopalian Process for a Baptism." 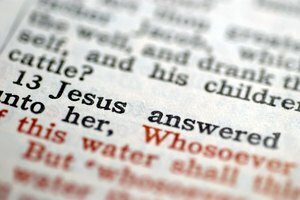 Synonym, https://classroom.synonym.com/the-episcopalian-process-for-a-baptism-12086186.html. 04 October 2017. What Is the Contemporary Culture Meaning of a Baptism Ceremony?